A great item to keep handy for those who do SMD board population. 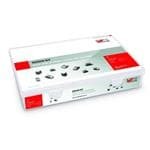 The Wurth General Purpose Capacitor Design Kit holds a multitude of common values of 0603 size Ceramic Capacitors in varying voltages and tolerances. At 50 units each of 72 variations of 0603 caps, it covers a large variety of situations where a spare cap could be needed.